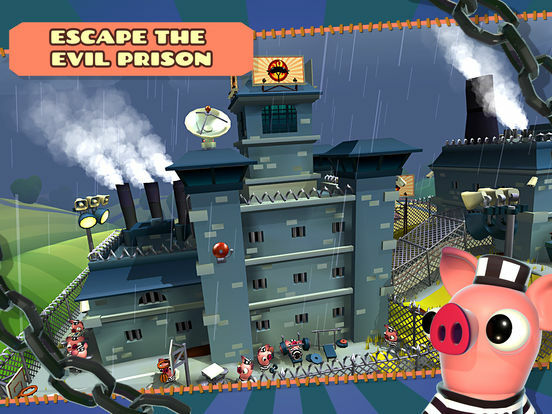 A pig has escape from prison, and you have to keep them moving. That's the entire point of Bacon Escape. The trick is to time your screen taps well enough so as to keep various hazards from ending the escape prematurely. Knowing what to look out for, and how to keep it out of the way, is very important. Who rides what makes no difference. The characters and carts you unlock don't actually affect the gameplay, so just choose whichever matchup you prefer and stick with it. Cash in on completed challenges. There's a list of three challenges that's always active (stuff like tumbling a specific distance after a crash, collecting a specific number of coins, etc). Every time you complete one of these challenges it'll earn you some extra coins, but only if you collect them. This is also important to remember because new challenges won't replace the old ones until you manually collect them. Grab it all. Scattered throughout each level are things like coins and apples (sometimes treasure chests, too). Make it a point to collect these when you can, because they can be useful later. Coins are for unlockables, apples are for continues (and unlockables). You can save up and spend coins to unlock chests from the main menu, or unlock some characters and carts from the appropriate selection screen. Similarly, you can spend apples to continue if you wipe out, or to unlock certain items. Hazard color matters. The color of the hazard determines what you need to do to manipulate it. Blue requires tapping to switch the object (i.e. turn 180 degrees, switch locations, etc). Red requires tapping and holding to deactivate hazards or move platforms. Purple requires you to not touch the screen at all. You get the idea. Keep looking ahead. This is a great way to see what hazards are coming, but there are a lot of branching paths, especially in later levels. If you're quick enough you should be able to spot the one that's either the most lucrative or the least difficult, then follow it. More difficult doesn't always mean better. Sometimes you'll find more coins or apples along the tougher pathways, but more often than not there's a fairly even split between item distribution. What this means is that you can usually collect just as much worthwhile stuff by sticking to the less challenging paths. Springboards are your friend. You can usually spot a springboard by looking for a flat blue platform with coins floating above it. Tapping at the right time will launch your cart into the air - collecting all the coins and usually putting you on a new path or even avoiding a collision. 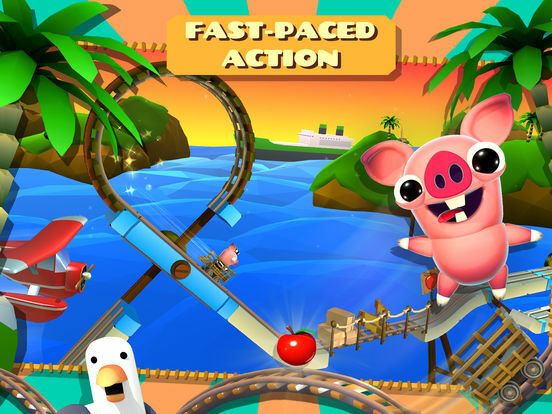 Bacon Escape is a pretty solid auto-runner, truth be told. It's pleasantly cartoony, tasks players with manipulating the environment rather than the runner, and has lots of characters to unlock. It can sometimes be tough to spot the smaller hazards due to all the activity on screen, but all things considered that's a minor gripe. Ultimately it's a fun time and worth the download. I have no idea what this pig did, but apparently freedom was really important because Bacon Escape immediately starts with a dramatic prison break. Well, the last bit of the prison break, anyway. The pig comes busting through a wall, then proceeds to ride a mine cart down a series of hazard-filled tracks, presumably in the name of freedom. It's an excuse to make an auto-runner, I guess? Bacon Escape took me a bit by surprise, to be honest. I wasn't expecting it to be in 3D, much less look as good as it does. I don't know, I think I somehow managed to avoid looking at screenshots before playing it. My point is I was thinking it would be a 2D (i.e. 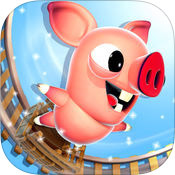 flat) endless runner about a pig in a mine cart. Instead I got something a little different, and a little better, than that. I mean it's still about a pig in a mine cart, but it's better looking and more fun than I thought it would be. The other thing about Bacon Escape that took me by surprise was the auto-running itself. I was expecting to be tapping the screen to make the mine cart jump, as is usually the case with these sorts of games. Instead, tapping the screen affects the hazards that appear along each level's path - flipping spike strips over, activating springboards, and so on. I know this isn't a new concept or anything, but it's still a change of pace from the norm even if it's been done before. I especially like how there's a little variety in how the hazards work: blue ones need to be flipped with a single tap, red ones require tapping and holding the screen to move, and so on. Aside from general progress through the different levels (yes, there are levels), I'm also fond of all the different characters and carts that you can find and unlock. They don't actually change anything in the game itself, but I always like customization options in my games no matter how simple they might be. I'm currently using an old Model-T looking car and it's being driven by a cat! The one problem I've run into (almost literally) in Bacon Escape is the way some of the hazards are presented. It's not a terribly common issue, but on more than one occasion the size, positioning, or orientation of a hazard has made it extremely difficult to parse - leading to me crashing into something that I honestly could not see coming. I mean if I time my taps wrong or whatever that's one thing, but to think I'm in the clear only to run into an extremely hard to see spike trap that's partially obstructed by birds or blends in to a wooden fence that's behind it feels wrong to me. These moments, infrequent though they may be, trike me as a bit unfair. I can't stay mad at Bacon Escape, though. For the most part failure comes down to player error, and aside from that one annoyance it's actually quite enjoyable to play. I can see myself getting tired of it eventually, as it always the case with me and arcade-y action games, but I know it'll be fun while it lasts.